Thank you for these photos – I think it is a marvellous idea – as so often when you send flowers you have no idea what they look like. Congratulations on your service. The information that I have received has been exemplary – it certainly makes me feel valued as a customer. Make this the best day ever and send Birthday Flowers, Birthday Gift Baskets, or a gift package of Chocolates and flowers. Happy Birthday balloons and lovely birthday bouquets are the perfect present, to send your wishes to share in their special day. YES we can deliver same day if you order before 10.15am for a business delivery and order before 2.15 for a same-day home delivery. Saturdays order before 9.30am for same day delivery Auckland wide. Birthday Balloons - Age 1 to 100 years! Birthday balloons are a great present idea for a 21st, 30th Birthdays, 40th, 50th birthday gifts, 60th, 70th, 80th birthday even 100! Please note: The Age balloons are only available as a floating helium balloon size. We can do a balloon in a box or you can add a balloon to your birthday bouquet. 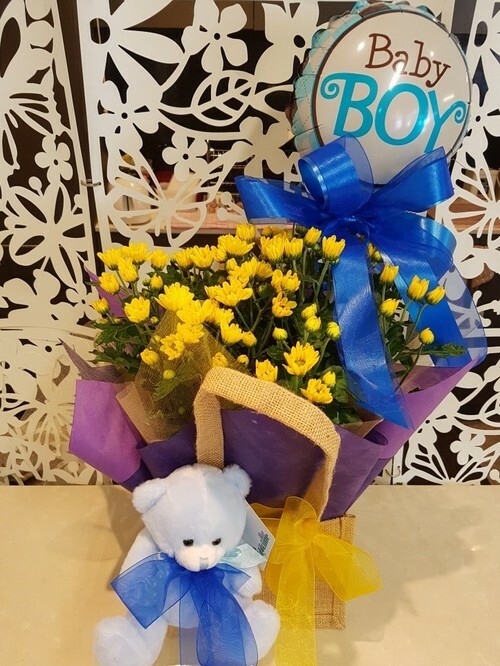 We can deliver Birthday flowers Auckland wide, and can easily add a Happy Birthday balloon, chocolates and a wide range of N.Z. speciality treats, Scullys products, candles, vases and other gifts to create a thoughtful celebration birthday gift basket. 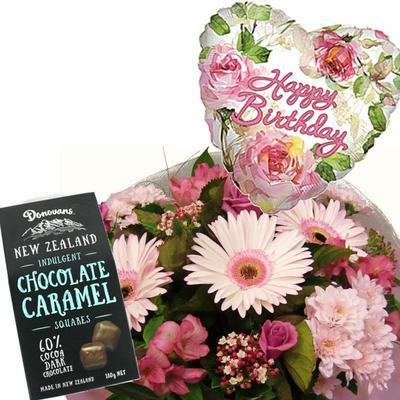 Just call and speak direct to our florists on 09 838 9058 and have birthday gifts delivered Auckland wide. Our TopShop Winning flower and gift store has a wide selection of presents we can send with your birthday bouquet, giving them the joy of receiving flowers today, and a special keepsake gift to remember your thoughtfulness.